If you're looking for dividend stocks with great prospects, here's a close look at five companies that may be ideal for your portfolio. Dividend stocks are a wonderful way to grow your wealth and generate income. The trick is finding companies with dividends that aren't at risk of getting slashed overnight, and have prospects to increase payouts over time. We asked five of our top contributors to discuss a dividend stock they think investors should be paying attention to right now, and they gave us a diverse list of companies across different industries for your consideration. If you're putting together a list of dividend stocks to consider, keep reading. One (or more) of these five could be exactly what your portfolio needs. Jason Hall: Since bottoming out in late January, shares of Harley-Davidson Inc. (NYSE:HOG) are up almost 34%, but they're still well below the recent high in late 2014. What gives, and why is Harley worth short-listing? It's a great company with a powerful brand and product -- and strong long-term prospects to continue growing its business. The decline in Harley's stock price from its peak in 2014 has largely been a product of concerns over a weakening global economy (Harley's best growth prospects are widely considered to be outside North America) and increased competition in North America cutting into its sales and profits. But these are largely short-term concerns, and Harley's reputation and brand power and the expansion of the global middle class are far more likely to result in growth for the venerable motorcycle maker over the long term. Today, Harley's shares are yielding 2.7%, and it only paid out about 35% of profits in dividends over the past year, giving the dividend a certain amount of safety and room to grow. Factor in a reasonable valuation with a price-to-earnings multiple below 13, and there's a lot to like. Harley isn't risk-free. Large exposure to consumer debt during the Great Recession nearly crippled the company, and its in-house finance business remains an important part of the business -- and a source of risk if the economy weakens. But even with that risk, it's worth taking a closer look at Harley-Davidson as a solid long-term dividend investment. Tyler Crowe: There's something to be said for those business-to-business kind of companies that have made themselves almost indispensable to customers. That pretty much sums up W.W. Grainger (NYSE:GWW). The company's role as a supplier of operations, repair, and maintenance equipment makes its customers procurement process that much easier by providing just about anything a company needs, ranging from the basics of janitorial and laboratory supplies to the more complex and niche products, such as transmissions and specialty power tools. That's how the company has built a customer base of more than 3 million businesses across North America. On the surface, this may seem like a pretty mature market. Supply and distribution companies have been around for a long time. What provides the opportunity, though, is that it's still a highly fragmented market, especially when supplying to small and medium-sized businesses. That's where Grainger thinks it can really make hay in coming years, as it develops tools to better assist companies of this size through online purchase platforms, and more customized supply contracts that are better-suited for smaller businesses. This is a lever the company thinks it can pull that will grow revenue while maintaining its strong margins and better than 20% returns on equity. It helps that management has steadily raised its dividend and bought back gobs of stock to increase total returns. GWW Dividend data by YCharts. 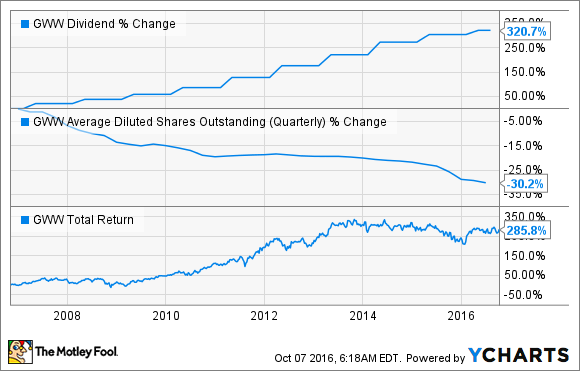 Grainger's 2.1% dividend yield isn't going to jump out on paper today. When you add in the growth levers it can pull and management's propensity to grow shareholder value, W.W. Grainger is definitely a dividend stock worth a deeper dive. Steve Symington: Starbucks (NASDAQ:SBUX) stock is down around 11% year to date as of this writing, including a modest 4% decline since I singled out the coffee giant as a delicious option for beginning investors three months ago. But we focus on long-term investing here at the Fool -- an approach that works especially well with dividend-paying industry stalwarts like this one -- and nothing has happened between then and now to water down my resolve. Starbucks still enjoys multiple growth opportunities, from expanding both its geographic reach and product lines. Regarding the latter, for example, Starbucks' channel development segment -- which includes packaged goods like its ready-to-drink beverages and ground coffee as well as foodservice accounts -- saw sales grow a healthy 9% year over year last quarter, driven by higher sales of single-serve products despite intensifying competition in the space. Regarding the former, Starbucks ended last quarter with an eye-popping 24,395 stores globally. Though 15,300 of those stores are in the Americas, Starbucks still anticipates opening around 600 locations in the U.S. alone this year -- many of which will be smaller-format or stand-alone drive-through locations that require lower overhead costs and often achieve higher-than-average sales. Starbucks is growing even faster in China/Asia Pacific, where it ended last quarter with 6,127 locations and expects to grow to around 10,000 by 2019. Within that total, second-quarter comparable-store sales growth came in at an exceptional 7% in China, driving record revenue and profit from the country as it stands with around 2,200 locations. That number should more than double in the Middle Kingdom over the next five years. So, it should come as no surprise that over the long term, Starbucks expects its store presence in China to be at least as large as it is in the United States. In the end, if you're willing to fill your cart with Starbucks stock now and watch patiently as its growth story continues to unfold, I think you'll be more than happy with its market-beating results. Matt DiLallo: When it comes to dividends, there are five critical components I look for before adding a stock to my portfolio. I want a generous current yield supported by stable cash flow, a conservative payout ratio, and a strong balance sheet as well as a clear visibility into future growth. It's a formula that should deliver consistently rising income for years to come. One stock that checks all of these boxes is Canadian energy infrastructure giant Enbridge (NYSE:ENB). With a current yield of 3.6%, the pipeline company provides nearly twice as much income as the average stock in the S&P 500. Further, that payout is on rock-solid ground because long-term contracts underpin 96% of the company's cash flow, it only pays out about 50% of its cash flow in dividends, and it has a solid investment-grade credit rating along with improving leverage metrics. In addition to that, Enbridge has the best growth pipeline in the energy infrastructure sector. The company has a gargantuan $20 billion of commercially secured projects in development. These projects support the company's ability to deliver 12% to 14% annual growth in available cash flow per share through 2019. Further, with another $37 billion of projects in the pipeline, Enbridge believes it can grow its dividend by a 10% to 12% compound annual growth rate all the way through 2024 while delivering improving credit metrics and maintaining a conservative payout ratio. That is visible dividend growth few companies can match. George Budwell: Bristol-Myers Squibb (NYSE:BMY) has now dropped by more than 12% since releasing disappointing results from the CheckMate-026 study assessing Opdivo as a front-line monotherapy for non-small cell lung cancer (NSCLC). Adding insult to injury, the company's recent presentation at the European Society for Medical Oncology revealed that Opdivo even failed to benefit a smaller sub-group of patients with high levels of the target protein PD-L1, creating deeper concerns about the drug's ability to break through as part of a combination treatment for NSCLC later down the road. However, I think the market's reaction to this news is overdone by a long shot, especially in light of Bristol's above-average dividend yield of 2.74% for a major drug manufacturer. The heart of the matter is that Bristol is still expected to post top-line growth in excess of 7% next year thanks to a host of growth products such as Opdivo, Eliquis, Orencia, and Sprycel, among others. In short, Bristol isn't a one-trick pony, and it's still posting some of the highest levels of top-line growth among large-cap pharma companies right now. So, while the loss of an estimated $4 billion in sales from Opdivo's failure in CheckMate-026 is certainly groan-worthy, the sky isn't exactly falling. Opdivo, after all, still stands a chance at recouping some of this lost ground via the ongoing CheckMate 227 study, where Opdivo and Yervoy are being evaluated as a combination therapy in front-line NSCLC. Cutting to the chase, Bristol looks, to me, like a compelling buy after this double-digit pullback because of its strong growth prospects, diverse revenue stream, and sizable yield for a pharma stock.